This is a call out to everybody who wants to get involved, but has a busy life! We know you’re out there, and we love you for your support. Here are some specific things you can do to keep the movement going strong. The Reno Gazette-Journal has granted us two 500-word columns in an upcoming issue. 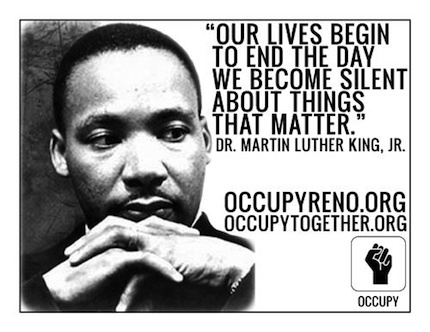 We will publish two pieces, each written by one person who supports the Occupy movement. 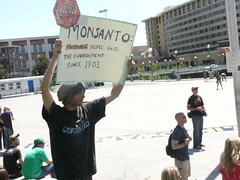 If you have something to say, write it down and send it to media@occupyreno.org. 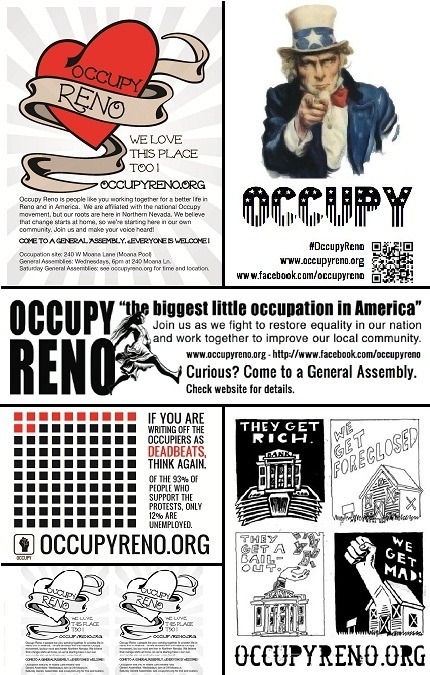 You can read the current submissions here: Articles – Why I Support Occupy Reno. Don’t stop there! Our Issues discussion forum is a great place to participate in the creation of a declaration of our beliefs. Check out the Mission Statement currently being drafted, and make your voice heard on the topics that are important to you. We have an IMMEDIATE NEED for people who can print flyers and bring them to General Assemblies! If you can print some at home, or stop by a print shop, please do it TODAY. Yes, black-and-white photocopies are good enough! If you can distribute flyers yourself, even better. It’s time for us to improve our visibility by occupying every windshield and billboard. Find flyers in the Flyers and Graphics directory. More fun stuff at OccupyDesign.org. We’re working on setting up some fundraising. In the meantime, the Occupy camp has some specific needs. We’re looking for big water containers, waterproof tarps, thermals and long johns, and paper plates. If you have any of those things, bring them down to 240 Moana! If you’ve got anything else — skills, time, material goods or ideas — to give, send a note to info@occupyreno.org and let us know how you can chip in. Occupy Reno is holding its first day of community service this Sunday, in conjunction with Keep Truckee Meadows Beautiful. Tools will be provided, just bring your willing hands and help us clean up our town! Stay tuned for location and time. 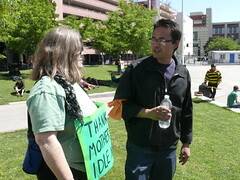 If you want to be involved in upcoming community service, email outreach@occupyreno.org. Check in when you can for updated ideas on how to stay involved! Our needs change daily. See you tonight, 6pm at 240 Moana for a General Assembly.